Video: Access Live: Interview with Awestruck's Dr. Zelana Montminy . Video: Dr. Zelana Montminy talks about her new book, 21 Days to Resilience. Video: The Doctors: Simple Ways to Reduce Stress Now. Video: POPSUGAR Fitness: 8 Tips For Finding Balance in Life. A leading figure in Positive Psychology and one of Maria Shriver’s Architects of Change, Dr. Zelana Montminy takes mental fitness to another level. She is the author of 21 Days to Resilience (HarperElixir), which was #1 on Amazon in Mental Health and has been published in 5 languages. Internationally-acclaimed speaker, and go-to media wellness expert, Dr. Montminy translates complicated research from positive psychology and the fields of nutrition and neurology, to create a uniquely holistic approach to health. Resilience is a quality most of us want to possess. How we actually attain the skills to become resilient has been left out of the conversation. Until now. 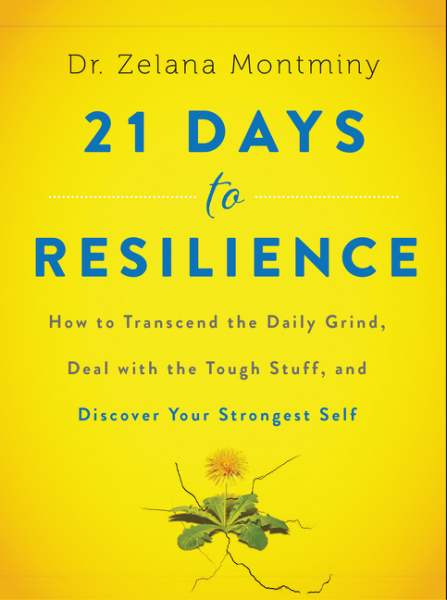 In 21 Days to Resilience, Dr. Montminy offers a practical, science-backed toolkit to develop your capacity to handle whatever life throws your way—and thrive. Each day of her powerful program, Dr. Montminy introduces a key trait necessary to improve resiliency and enhance wellbeing, such as gratitude, focus, playfulness, self-respect, and flexibility, then provides three simple tasks to accomplish that day—one in the morning, one during the day, and one in the evening. 21 Days to Resilience lays the foundation for happiness and shows you how to build your strength to carry you through the rest of your life. Dr. Montminy holds masters and doctorate degrees in clinical psychology with a specialization in health, as well as a certificate in plant-based nutrition from Cornell University. She seeks to explore the relationship between resilience, happiness, and healthful lifestyle choices. She is a member of the American Psychological Association (APA), an active regional board member of the Young President’s Organization (YPO), a consultant for the Institute for Applied Positive Research, and on the Program Advisory Board of the Respect Institute. Currently Dr. Montminy has a talk show called "Free Healthcare" on Awesomeness TV and is shooting a series for Lifetime Television on resilience and parenting. Dr. Montminy runs a private resilience coaching practice, as well as offers seminars to various groups and organizations. Some of her corporate clients include the Coca Cola Company, Saks Fifth Avenue, Procter & Gamble, and more. She has been a regular on The Dr. Oz Show, The Doctors, The Today Show, Good Morning America, E! Entertainment Television, and Access Live. She also appears in Cosmo, Parents Magazine, People, Redbook, Mind Body Green, Huffington Post, Health Magazine and more. A prominent presence on the lecture circuit, addressing academic institutions, businesses, and non-profits at conferences and retreats on a range of topics, Dr. Montminy shares the knowledge, vision, and practical tools necessary to manifest true transformation in all aspects of life. Whether speaking at an intimate gathering for a full day retreat, parenting seminar or a large-scale auditorium, her presentations will resonate with you. Dr. Montminy is an avid traveler and speaks five languages, including Russian, Spanish, and French. She currently lives in Los Angeles with her husband and two young children. "Dr. Zelana Montminy’s building resilience presentation was insightful, engaging and tailored specifically for our company, so much so that it resonated well with our large, diverse group. Dr. Zelana is a refreshing change to traditional speakers. Dr. Zelana’s talk truly brought food for thought with actionable takeaways to help enrich our personal and professional lives. Dr. Zelana even took time to individually greet and also personalize her 21 Days to Resilience book for all those in attendance. Dr. Zelana’s presentation continues to be a much talked about event which is proof of the positive lasting impression she brought to the HMSHost team. Thank you, Dr. Zelana." "Dr. Zelana's presentation was fabulous! It was the perfect combination of humor, education, entertainment and enlightenment. She left us all wanting to hear more (was that really an hour!? ), which is why the books were completely sold out within the first 20 min! She is like the brutally honest best friend we all want, but with the credibility and expertise to back everything up." "I was thrilled when Dr. Zelana was available to take a quick break from her 21 Days to Resilience book tour to speak at our event. She shared brilliant insights in to the pressures of our "high expectation lives" of today with solid and scientific backed research that gave us understanding on how resilience is a key component to being "happy". Not only is her content relevant and applicable but she presents it in such a way that you wish you could spend the entire afternoon listening to her speak. She fills the room with her positive message!" "Dr. Zelana is an insightful speaker who will challenge your assumptions on happiness and offer actionable steps on how to become more resilient. She is passionate, professional, and genuine not only in her presentation style, but in her interactions with individuals. Her approach to boosting well-being through resilience is powerful and much-needed in our modern world." “Dr. Z is a dynamic speaker that makes you think carefully about becoming your best self. Her passionate message about becoming evermore resilient has inspired me as a professional woman and mother to think deeper and be more mindful every day." "I recently had the pleasure of participating in a personal development session facilitated by Dr. Zelana Montminy during a business meeting. We were introduced to Dr. Z’s work about resilience, participated in an exploration, and shared our experiences with the group. Under Dr. Z’s intense gaze and thoughtful questioning, challenges were met, revelations were made, and we all left with tools for the future – all in just 60 minutes. I’ve already pre-purchased my copy of her new book and greatly look forward to implementing her program for a happier future!" “Dr. Montminy was an excellent resource who was engaging, thoughtful and informative. Her advice has real and meaningful impact on people’s lives! I would use her again and again”. --Elizabeth Griffin, Regional Director, YPO-WPO Pacific U.S.
"Dr. Z demonstrates the correlation between healthy eating and happiness in an entertaining fashion and with compelling scientific arguments that gets the entire audience engaged. We all left energized ready to change our habits to promote a healthier happier lifestyle."